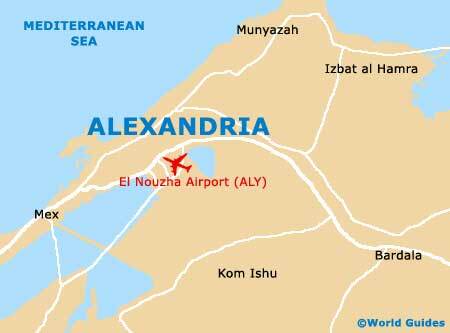 Alexandria stands on a fairly narrow strip of land, with Lake Mariut located on the city's southern side and the Mediterranean Sea on its northern side. 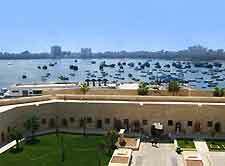 The climate in Alexandria can be described as temperate, with warm and often extremely hot, sunny weather by day, followed by cooler night-times. During the winter months, Alexandria's climate offers temperatures of around 20°C / 68°F by day, dropping to just below 10°C / 50°F on most nights. The summer weather is markedly hotter and whilst the climate in Alexandria is never quite as hot as that of Cairo, summer highs can reach 30°C / 86°F or even 32°C / 90°F on occasion, being affected at times by humidity, although the refreshing sea breezes are known for reducing moisture levels. 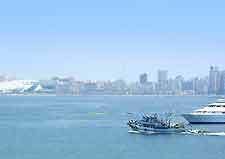 Alexandria's cooler summer weather (in Egyptian terms) has made this area an especially appealing tourist destination and whilst the sunshine can be hot, it is never unbearable and suits those who expect constant sunshine on a holiday. Egypt is amongst the driest countries in the world and averages just 80 mm / 3.1 inches per year of rain. However, Alexandria does receive a much higher rainfall, with annual precipitations of around 200 mm / 7.9 inches, which is fairly wet for Egypt, but for most of us, still extremely dry and resulting in a fairly arid landscape.